WASHINGTON — World premiere musicals at Arena Stage should get everyone’s attention. Best case scenario, they follow the path of “Dear Evan Hansen,” which debuted at Arena Stage in 2015 before becoming a Tony-winning smash on Broadway. Worst case scenario, D.C. audiences have at least seen something fresh, daring and creative. It’s a win-win either way. 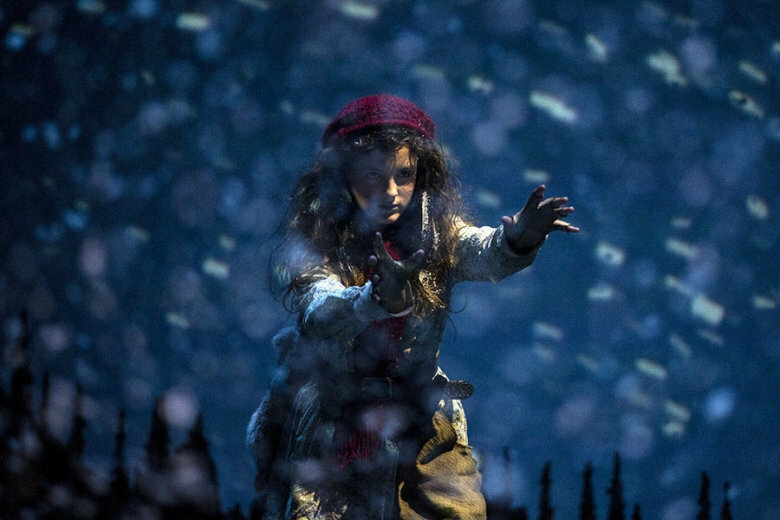 And so arrives “Snow Child,” making its world premiere at Arena Stage now through May 20. Adapted by John Strand from Eowyn Ivey’s Pulitzer-finalist novel, the story follows Mabel (Christiane Noll) and Jack (Matt Bogart) in 1922 Alaska. Grieving the loss of their unborn child, they hope for a miracle and build a tiny snowman. Suddenly, a mysterious young girl (Fina Strazza) arrives. Did their snowman magically come to life? Or is it merely a coincidence? The time period is important not only for overall atmospherics but also for gender dynamics. Visually, expect wool costumes, cabin set pieces and wintry backdrops. This Alaskan atmosphere is filled with wildlife brought to life by intricate puppets. Along with the visuals, the music also captures the setting thanks to composer Bob Banghart. These unique instrumentals are married with the Broadway lyrics of Georgia Stitt. Together, the music and lyrics combine for all-new musical numbers. The entire exercise is a fitting choice by artistic director Molly Smith, who hails from Alaska. She commissioned this as part of her ambitious Power Plays initiative, staging 25 new works over the next ten years, with each representing a different decade in American history.